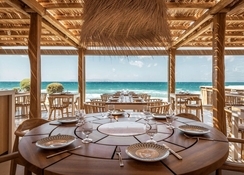 The five-star, all-inclusive Rinela Beach Resort & Spa enjoys a picturesque location on the Kokkini Hani beach in Crete. The property, built in traditional Cretan-style architecture is located just 12 km away from the town centre of Heraklion. The guest rooms are comfortably furnished and affords scenic views of the sea or the gardens. They come fitted with all modern amenities to offer you a superbly peaceful stay. There are three main restaurants and six bars offering a plethora of cuisines and tastes, from Greek to international delights. The hotel’s stunning beachfront location allows guests to access the beach anytime of the day to enjoy a range of water sports. Water lovers will enjoy taking a dip in the resort’s swimming pools that include 3 seawater pools, 2 fresh water pools, an indoor pool and 2 water slides, ideal for children. For more relaxation, check out the spa and wellness centre that offers a range of body, facial and beauty treatments. The family-friendly resort is also ideal for the little ones who can enjoy at the kids’ pools, water slides, children’s playground and a mini club. Mitsis Rinela Beach Resort & Spa is situated right on the beach in Kokkini Hani village in Crete, the largest of the Greek islands. 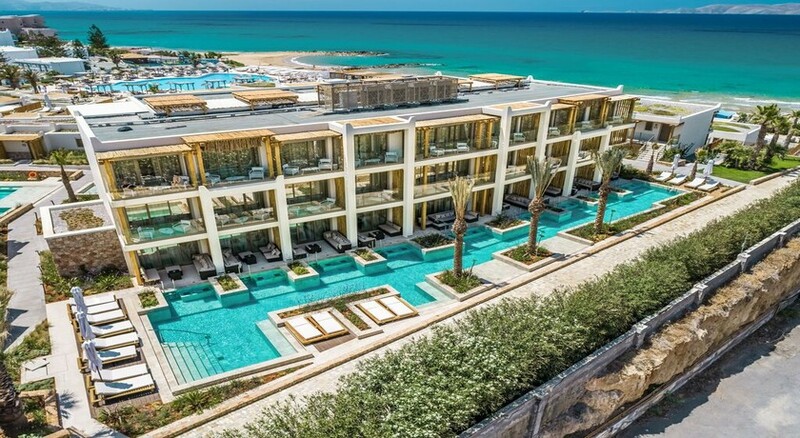 Renovated in 2010, this seafront resort is also close to the hustle and bustle of city life, located just 12 km from the Heraklion town centre, although there are ample shopping and eating destinations near the hotel. 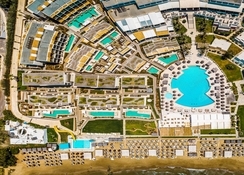 The beach is one of the main attractions, but you can also explore a lot other places in the neighbourhood, such as Watercity Waterpark (1 km) and Creta Aquarium (2 km). The archaeological sites at Knossos (20 km), Natural History Museum of Crete (20 km), Heraklion Archaeological Museum (14 km) and Heraklion fortress (14 km) are accessible from the hotel and make for a good day trip. The Heraklion Airport is 10 km from the hotel. There is a total of 441 guest rooms in Rinela Beach Resort & Spa that are well-appointed with a warm decor and wooden furniture. Categorised into family rooms, seafront rooms, and sea and garden view rooms, all the accommodation options come fitted with marble en-suite bathrooms with bath amenities, private balcony or terrace with great views, mini bar, marble flooring, air-conditioning/heating, telephone, satellite TV, safety deposit box and Wi-Fi. The hotel provides extra amenities to VIP guests, such as room service from 7am to 12am, luxury bath amenities, refill of mini bar etc. The family rooms have a separation in the middle of the room so that half of the room can be used as a second bedroom or a lounge. Some family Rooms have a sharing pool. The main restaurant serves breakfast, lunch and dinner in buffet-style where guests can enjoy local and international cuisines. 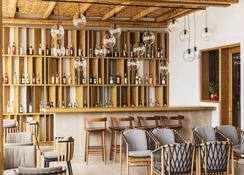 The a la carte dining options include a Chinese restaurant, a beach tavern for snacks and the Café Rinela offering refreshing drinks. The main bar affords a stunning view of the sea, which can be enjoyed while enjoying beer, wine, cocktails or mocktails. The Major Pool Bar serves local and international alcoholic and non-alcoholic drinks, ice creams and other refreshments. The Petit Pool Bar is a great place to enjoy soft drinks, coffee or beer while having fun at the water slides. It also organises cooking shows (daily from 10am to 5pm) by Greek village women who prepare traditional vegetable and meat pies. There’s also a beach bar and an open-air disco/theatre bar. Mitsis Rinela Beach Resort & Spa is a water lover’s paradise. There are six swimming pools – 3 seawater and 2 freshwater – including kid’s pools. There are two water slides, and plenty of sun beds and umbrellas (beach towels with extra cost) around the pools and the beach. 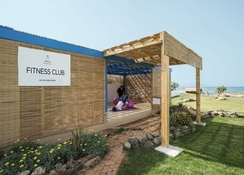 Guests can take part in the pool games like aqua aerobics, water gymnasium, water polo and more. The beach provides water sports opportunities such as windsurfing, water skiing, canoeing, pedal boating, banana boat, jet-skiing or diving. Sports facilities include 2 tennis courts, table tennis, basketball court, billiards, beach volleyball, darts and other board and cards games. Kids between the ages of 4 and 12 years can join the mini club, which hosts a number of fun activities. There’s also a children’s playground, kids’ pool and water slides for the young ones. The on-site spa – featuring an indoor pool – offers reflexology therapies, massages and beauty treatments. New technology satellite TV 32"
My family and I had a fantastic time. The staff were helpful and attentive. They really looked after us. The all inclusive was wonderful. this hotel is one of the best we have stayed in, from the time we arrived from the time we left. nothing was to much to ask of the staff, very helpful, very happy to help in any way they could. always singing and laughing. Forget about your sea view, we had a room down by the wall waterfall, out of this world, the rooms and the gardens were kept very clean and tidy. plenty of sun bed around the pool and on the beach. Food in the restaurant was very good, plenty of things the choose from every day. Would recommend this hotel to any one, even though there were not many English staying there it did not bother us as the hotel was so good. Hotel is scrupulously clean, all staff are polite and welcoming. Rooms are adequate with daily clean, tea and coffee making facilities and fridge with cold drinks. Robes & slippers are provided, as well as complimentary toiletries. Massive choice of food with speciality Chinese and Greek restaurants as well as main restaurant, pool bar (toasties, waffles, crepes, ice cream, cake etc) pizza and pie hut and copious choices of cocktails and beverages. Spa was a bit pricey (haggle for a deal!) but the massage we treated ourselves to was sublime. Outside pool was a little cold for our stay in April. This is our 2nd holiday in this hotel and I couldn’t fault it, except for a teeny drawback being the steps, but it’s built on a coast, so that can’t be helped. Would highly recommend it and would seriously visit again. Too many people for the ONE Dining Room. Some had to queue for at least 10 minutes for entry. 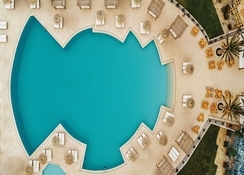 The Mitsis Rinela Beach Resort & Spa in greece is a lovely hotel. It is immaculately kept and the rooms are not massive but big enough and well appointed for this class of hotel. The food is a mixed bag really. The main food hall I found disappointing. But there are other places to eat which include a pizza oven which which is fantastic, an ice cream / sandwich bar, and 2 bookable ala-carte restaurants which are both great. There isnt much to do around the hotel. Theres only one street with a couple of hotel bars and a couple of eateries and a couple of small shops. Their is a service bus which can take you into Heraklion city for 2 euros. Overall a very good hotel and food with limited stuff to do outside.